Noted theatre and social activist Prasanna of Gram Seva Sangh has been on an indefinite fast –since 14th October 2017 demanding “Zero Tax” on handmade products. He took the decision of an indefinite fast as several actions nation-wide as part of the Sathyagraha demanding “zero tax” were not responded to by the GST Council of India. The Sathyagraha has captured the imaginations of millions nation-wide and brought in a new awakening in the consumer. There is a growing collective demand to ensure India’s governance keeps the promises made in the Constitution of India and the Freedom Movement that there is active and willing support to sustain crafts people and such others who depend on their hands and skills in building the nation. Dr. B. R. Ambedkar spoke extensively about the need for positive discrimination favouring handcrafting artisans and communities who are essentially rural, fisherfolk, pastoral, artisanal, tribal and such other natural resource dependent communities. This was also in acknowledgment of the State’s role in correcting a major historical wrong committed against craftspeople who had been violently suppressed during British regime. Gandhiji promoted the Charaka as the praxis of producing one’s own essentials as the most profound act of sovereign existence, and that without damaging the Earth or causing injustices to others in one’s life. The idea was to build a just economic system that was both ecologically sustainable and ethical. As a part of this movement for fundamental reform, the State was called upon to enable and empower communities who provided us with our daily needs with a wide range of hand made products, and which were produced without damaging the earth. Positive discrimination favouring handmade products by not taxing them would be the most fundamental support the State can extend to provide these highly marginalised communities with a chance to secure a dignified existence, all with their own labour, craft and skill. In introducing GST on handmade products, the GST Council of India, which is a negotiated process of all States and the Union Government, has comprehensively ignored the critical importance of such positive discrimination favouring the handicraft sector. Instead, handmade products have been heavily taxed, ranging between 5% and 28% (the highest tax bracket). The result of this will be mass impoverishment of the rural and informal sectors that support millions of livelihoods by making handmade products. Further, it will result in hand made products having no chance whatsoever of competing with mass-produced consumer goods, which are supported with a whole range of sops: such as easy credit supply, handsome tax breaks, easy and cheap access to natural resources, infrastructure, and also cheap labour. This discrimination favouring the industrialised class is producing an economy that is highly divisive, where a miniscule percentage are hoarding all profits, while the costs are borne by the rest of us. Besides, the impacts are being passed on to future generations as well. Such an economy is unsustainable. (c) that the operation of the economic system does not result in the concentration of wealth and means of production to the common detriment”. The indefinite fast by Shri Prasanna is an outcome of the Sathyagraha that was formally launched by Grama Seva Sangha at Bangalore Town Hall on 7th September 2017. In full public view, hand made products were sold without conforming to the GST regime, practicing civil disobedience against an unjust tax. Noted film maker and theatre director M. S. Sathyu, veteran freedom fighter and Gandhian H. S. Doreswamy, journalist Dr.Vijayamma, poet Mudnakodu Chinaswamy, singer M.D.Pallavi, Shashidhar Adapa, film actor Kishore, artist S.G.Vasudev and hundreds of others participated. In subsequent weeks, the movement spread across various centres of south India. This gained the support from Sri Panditaradhya Swamiji, Sanehalli Matt at Sirigere (Karnataka). The Sathyagraha was supported in Tumkur and Sira towns by Yatiraju, Ramakrishnappa, Indiramma, Pandit Javahar, Tundoti Narasimaiah, Freedom Fighter Revanna, SIGNA and CMCA Volunteers and other likeminded people in. On 24th September, a Padyatra was taken from Junajappana Gudde (shrine of pastoral God Junjappa) to Arsikere Kasturba Ashram, a distance of 120 Kms. All along there were several exhaustive meetings with the farmers, artisans, jogappa’s, Traditional medicine practitioners, etc. At Arsikere, Sri. Panditaradhya Swamiji of Sanehalli Matt, Sree Kumar social Activist, Kulkarni, Weavers Union President, Poornima, Shivalinge Gowda MLA and various others joined the struggle which included blocking the Arsikere-Mysore road as an act of civil disobedience. Activists were arrested, an FIR was filed and then they were released. The movement continued its march. From Mysore, writer Devanuru Mahadeva, and various others joined the Satyagraha. From Challakere, Doddaullarthi Karianna of the Amrit Mahal Kaval Hitarakshana Horata Samithi and All India Kisan Sabha endorsed the struggle. Meanwhile, hundreds of letters and petitions were sent to various Chief Ministers, Union Finance Minister and the GST Council of India. On 9th October, a Gram Seva Sangh letter addressed to the Shri. Siddaramaiah, Chief Minister of Karnataka, and endorsed by various luminaries, explaining that “Zero tax on Handmade products would enable village producers to establish themselves in the urban market. It would liberate the poor from the debt trap and help them to lead a honourable material life.” Extending the support to the Sathyagraha, Federation of Indian Handloom Organisations President Smt. Uzramma wrote to the Chief Minister in which she said said: “Shri. Arun Jaitely has announced small concessions to handmade products. These concessions are highly inadequate”. She then urged the CM to get a resolution passed in the Karnataka Assembly “asking the GST Council to make all handmade products zero-taxed”. Renowned social scientist Shri. Ashish Nandy has led a panel of interdisciplinary experts from across India, at the request of Gram Seva Sangh, and prepared a detailed report on why 0% GST on hand made products is necessarily a just step. A list of over 200 products that deserve this support has also been provided to the Government and the GST Council. The committee includes noted film maker Shri. Shyam Benegal, handicrafts proponent Smt. Uzramma, social scientist Dr. A. R. Vasavi, Karnataka’s former DGP Shri. Ajay Kumar Singh, and others. Despite all these efforts, neither the Union Finance Minister nor the GST Council has made any commitment to accept this just demand. As a mark of protest against their silence, Shri. Prasanna launched an indefinite fast. Sri.Veerabadhra Chanamalla Swamiji of Nidumamidi Matt, Bengaluru, blessed and launched the indefinite fast on 14th October as part of the Sathyagraha. He warned that a “great divide exists today in the country, between India and Bharat” and that “India is living at the cost of Bharat”. Sri. Shivakumara Swamiji of Tumkur Siddaganga Matt has also extended unconditional support for the satyagraha. Shri. H. D. Devegowda, former Prime Minister of India, visited Prasanna, endorsed his struggle, and requested him to break the fast saying “everyone’s heart and mind has now been opened by this just struggle”. Prof. M.V. Rajeev Gowda, Rajyasabha MP and National Spokesperson of Indian National Congress met with Prasanna during the hunger strike, extended his solidarity and promised that he would raise the need for the Congress party to support this just demand with the party’s Vice president Shri. Rahul Gandhi. He was then joined by Shri. Krishna Byregowda, Karnataka’s Agriculture Minister, and both assured that the Government of Karnataka would take a supportive stand on the issue. Shri. Brijesh Kalappa, Congress spokesperson and Shri. Tanveer Ahmed, Janata Dal (S) spokesperson also joined the fast in support. These solidarity actions were followed by a tweet from the Chief Minister of Karnataka, Shri. Siddaramaiah: “CMO is working with Prasanna to prepare the list of hand made products for advocating zero GST at the Council”. Sri. S. G. Siddaramaiha, Chairman Kannada Development Board called on Prasanna and expressed strong views on the crippling GST on Handmade products of toiling rural people. He added that after Gandhiji’s Salt Satyagraha, Shri Prasanna’s campaign for the handmade products is a powerful moral stand in public domain. The Sathyagraha has been endorsed by several mass organisations, federations, cooperatives, political movements, etc. They include Janapada Seva Trust, Karnataka, Komu Sovharda Vedhike, Karnataka Rajya Devanga Naukara Sangha, Lancha Mukta Karnataka, Dalit Student Federation, Karnataka Janashakthi, Karnataka Vidhyarthi Sangatane, National Hawkers Federation, National Fishworkers Federation, National Alliance of Peoples Movement, Grameena Cooli Karmikara sangatane, Samudaya, Janata Dal (U), Janata Dal (S), Samajvaadi Party, Communist Party of India, Communist Party of India (Marxist), Congress (I), Rashtriya Swabhimani Andolan, Karnataka Gandhi Smaraka Nidhi, Karnataka Jyana vijyana samiti, SUCI, Sampoorna Kranti, Corruption-free Karnataka, Gandhi Bhavan, Jana Vadhi Mahila Sangha, All India Trade Union Congress, National Federation of Indian Women, Karnataka Rajya Devanga Naukarara Sangha, All Indian Bank Officers Confederation, Lancha Mukta Karnataka, Praja Science Vedhike, Ekta Parishad, Rashtriya Cheneta Jana Samakya, and several several more. We announce with pride that the second “Study Circle” session for Graama Seva Sangha was held on the 23rd of April, 2016 at GoodEarth Enclave, Kengeri. The session overall was successful in bringing together the registered GSS members and providing a forum to discuss and debate on various topics. We focussed predominantly on the topic of the study circle itself which was the reading of “Hind Swaraj” by Mahatma Gandhi. After this session, we followed it up with discussions based on the chapters, the contexts in which they were written and their practical application or possibility of application in today’s context. We also spent a few minutes discussing the cause, effect and potential actionable items for us regarding the spontaneous rebellion that Bangalore witnessed in the previous week, where Garment Industry workers took to the street to oppose the provident fund related move from the government. We discussed the tendencies of peaceful protests to turn violent and the unfortunate situation that seem to be encouraging only violent protests to get attention. The discussion also touched upon the topic of local and grassroots work that we all need to do (and continue doing in some cases) to uphold the spirit of Hind Swaraj. This included both the social and political movements which are closer to the people and ensures that the beneficiaries are the poorest of the poor. Some of the challenges faced today by the members as well as other like-minded folks also was brought on the table; challenges that have their root in populist culture as well as an inherent cynicism that exists in the society. The discussions concluded yet again with the ever present hopes that groups such as Graama Seva Sangha would remain the platforms to overcome the challenges. We closed the session with snacks and refreshments. Study Circle : Session 001 : Kickoff! We announce with pride that the first ever “Study Circle” session for Graama Seva Sangha commenced on the 26th of March, 2016 at GoodEarth Enclave, Kengeri. The session overall was successful in bringing together the registered Graama Seva Sangha members and providing a forum to discuss and debate on various topics. We focussed predominantly on the topic of the study circle itself which was the reading of “Hind Swaraj” by Mahatma Gandhi. The session commenced at 4.15pm after initial introductions. A short welcome and stage-setting was provided after which we proceeded to a “Purpose and Introduction” by Mr.Prasanna. After a quick revisit on the genesis of Graama Seva Sangha, Mr.Prasanna talked about the current affairs that we face today such as growing intolerance and a general lack of social purpose. He also discussed the interconnectedness between the social issues we face today and the environmental impact. He recollected how the Badanavalu Satyagraha, through its emphasis on sustainable lifestyle embodied values that transcend personal and social growth and touch upon equity issues. After this session, we proceeded to read two chapters from Hind Swaraj. 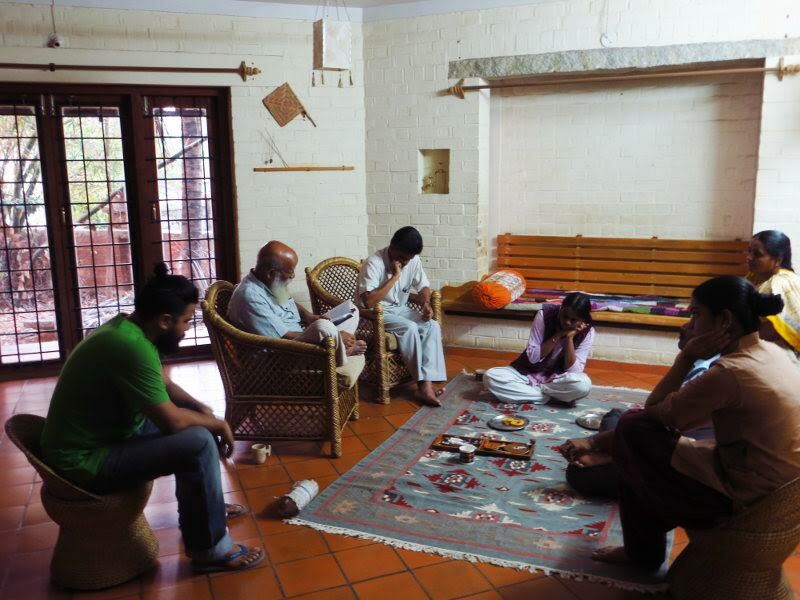 We followed it up with discussions based on the chapters themselves constantly reminding oneself and each other about the foresightedness of Gandhiji and his ability to imagine a world that was distant to him at that point but would eventually turn out to be. We closed the session with a demonstration of a “Book Charaka” by one of the members and a short introduction to the art and skill of spinning. Mr.Prasanna then volunteered to read an additional chapter from Hind Swaraj and we closed the day with snacks and refreshments.